Halliburton's management has said that we should expect a temporary slowdown for the rest of the year, but Wall Street is pricing the oil services company as though this slowdown in drilling will last much longer. Halliburton (NYSE:HAL) is North America's largest oil services provider by a wide margin. That position has benefited it immensely as oil prices have surged and production in the U.S. is approaching all-time highs. This past quarter, though, we started to see the downside of that exposure as pipeline constraints led many producers to back off their production plans. 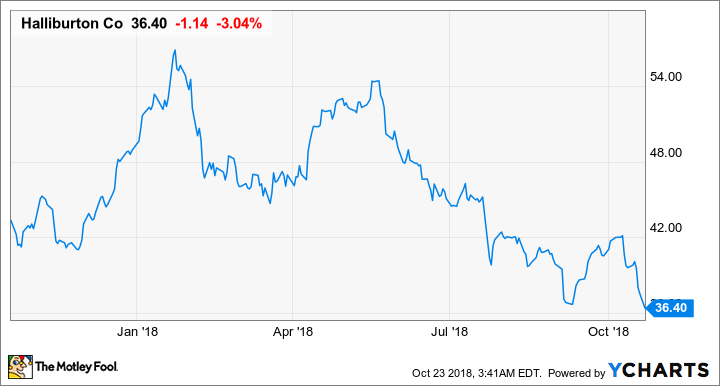 Halliburton's management had telegraphed this slowdown in the prior quarter, but that hasn't stopped the stock from dropping to their lowest levels since oil prices bottomed out in January of 2016. Management seems to think that this slowdown will continue for the rest of the year, but that will likely be the end of this lull. Despite this outlook, Halliburton's stock is trading like this lull is going to last a long time. Is that the case? Let's take a gander at the company's most recent earnings and management's outlook to see if Wall Street is baking in too much pessimism into shares of this oil services company. At first glance, it looks a bit strange that Halliburton's revenue increased despite calls for a weaker quarter and lower sequential earnings. Digging into the numbers, the reason for this was that revenue growth internationally more than offset the declines in North America. This was the first quarter in years where all three of its international geographic regions posted revenue growth. The reason that earnings didn't rise with revenue is that margins outside North America are much weaker. Oil and gas activity globally is still quite weak and there are a lot of services companies fighting fiercely on price for work. As activity grows, all of the spare equipment and crews will get absorbed, but for now, international pricing will not be as lucrative as it is in the U.S.
Data source: Halliburton. Chart by author. One encouraging sign was that Halliburton was able to produce a lot of free cash flow this past quarter, which management used to pay down some debt as well as buy back about $200 million in stock. With about $2 billion in cash on the books, buying back stock right now looks like a good use of cash because shares are trading at such a low price even though it's pretty apparent that the industry is recovering. On previous quarter's conference call, CEO Jeff Miller acknowledged there were some challenges facing the North American market, namely infrastructure constraints and bottlenecks. This quarter, he echoed some of those same themes and expected results for the rest of the year to be even lower. [T]he market for completion services softened during the third quarter, impacting service company activity and pricing, and Halliburton was not an exception. A combination of off-take capacity constraints and our customers' exhausting their budgets led to less demand for completion services than expected. Halliburton's response was to retain our customers who demonstrate the best efficiency, to manage costs, to move equipment to more active operators, to retain our people, to perform additional maintenance, and to continue investing in technology. Looking ahead to the fourth quarter, current feedback from our customers indicates that budget exhaustion and seasonal issues will predictably impact activity. We think operators will take extended breaks, some even starting before Thanksgiving. Therefore, we expect customer activity levels to decrease in the last six weeks of the year. We will do what a rational business would do in this situation. We will work to keep our equipment utilized in the short-term when it makes business sense to do so and we will take steps to position ourselves for a better 2019. You can read the full transcript of Halliburton's conference call here. We can all admit that the oil and gas industry is getting back on its feet. North America led the charge for the past year or so thanks to the short amount of time it takes to develop a shale well and lower costs that made previously uneconomical oil sources into productive reserves. That said, recoveries are never linear as they will inevitably hit a few speed bumps along the way. Who would have guessed 18 months ago that U.S. production growth would be stymied by a pipeline that is busting at the seams (probably not the best turn of phrase for pipelines)? These capacity constraints will get fixed. There are more than 2.5 million barrels per day of Permian Basin to Gulf Coast pipelines either under construction or taking bids from customers. When that happens, then production in North America will likely soar again. Additionally, spending is picking up around the world. That may be a lower-margin business today, but it should get better over time as more and more new capital projects get sanctioned. Putting all this together, it would appear that Halliburton's stock is trading on some very short-term pessimism that will likely clear up in the next year or so. For investors looking further into the future, this could be a good time to capitalize on Wall Street's shortsightedness.